I'm a fan of the books I've read in Novik's Temeraire series, so I was particularly excited for her new standalone novel with a female protagonist. Even more so when Sword & Laser chose it for their August book pick. Agnieszka lives on the edge of the Wood, protected by the Dragon. In exchange for this protection, the Dragon chooses one young woman from her village to live with him for ten years, at which point he chooses a new woman. Agnieszka assumes, with the rest of her village, that her best friend Kasha will be chosen. Surprise, surprise, Agnieszka is the Dragon's choice. Truthfully, this information, all covered in the blurb on the back of this book doesn't even make a dent in the true plot. 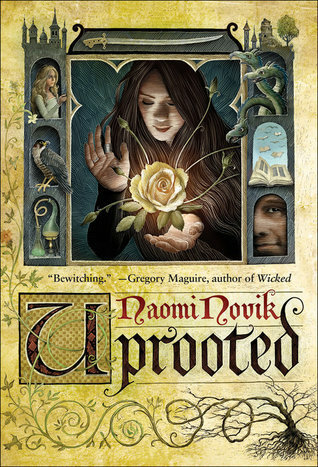 "Uprooted" is the story of Agnieszka's growth as a wood witch and a young woman. She learns of and develops her powers, and must uncover the secrets of the Wood to prevent it from corrupting and harming those she loves. Her journey of personal growth is also a tale of adventure, court intrigue, and friendship. Grounded in Slavic myths with which I was completely unfamiliar, this story felt fresh. Kasha and Agnieszka's friendship was wonderful to explore, and I appreciated that it took center stage over the somewhat stinted romance between Agnieszka and the Dragon. Agnieszka and Kasha have complementing strengths, and Novik explores their differences in such a way that respects both. Side note, the accent in the audio narration is a bit irritating if you prefer to listen at higher speeds, though the accent does add authenticity and helps with name pronunciations. Overall, it's a solid audio book of an excellent standalone fantasy novel. Verdict: Affirmed. With standalone fantasy novels getting harder and harder to find among new releases, this is a must-read for any fan of current fantasy. "Uprooted" by Naomi Novik, published May 19, 2015 by Del Ray, Audio narration by Julia Emelin, published May 19, 2015 by Random House Audio.